SLR also known as Statutory liquidity ratio is quantum of minimum allocation of funds in G-sec , SDLs and other approves securities. Banks, PF and Retirement Trusts are mandated to invest particular specific amount into above mentioned instruments. Banks SLR allocation is very much discussed hence one can always come to know whenever it is tweaked. 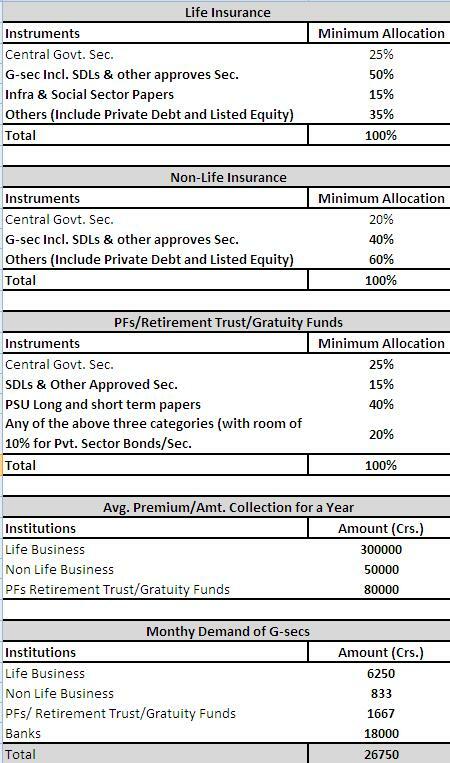 Below is the data I gathered on Investment norms for PFs and Insurance Companies. I hope it’s accurate. I would appreciate your inputs. Above figures are not accurate. But one can say near to actual. One should also keep in mind that it is not necessary that above four borrows every month captioned amount. They sometimes may be sellers for some period and then buyers in bulk the other month. Hence what we can see is that above institutions has the capacity to consume ~300000-350000cr of G-sec. Net borrowing via G-sec for 2012-13 is seen at ~480000Cr. Rest is taken care by RBI’s OMO, PDs (Underwriters) and FIIs.